After a stop in Zürich, Corteo continues its world tour. Already a series of five weeks of performances in Düsseldorf has been welcome by an enthusiastic audiences and excellent critics. Later, the show moves to Berlin for a premiere on November 28. 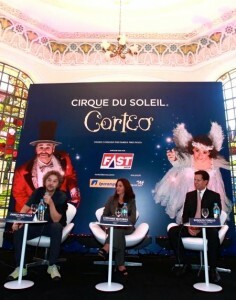 Corteo World Tour will arrive in 2013 in Brazil. To launch the Brazilian tour in Sao Paulo, more than 150 journalists attended the press conference where Daniele Finzi Pasca was present.